The Musical Theatre Companies are designed for students who want to be a part of a fun musical theatre experience! Auditions are optional and all levels of performers are invited to be a part of this show! In this ensemble-based show, every performer is in every song within their age group’s company, singing and dancing. The show will include all three companies and will be performed with full lighting and sound. The rehearsal process will also include educational elements about the theatre and performance! A wonderful opportunity for any child or teen who wants to have fun and experience the world of musical theatre! New for Spring 2019, we’re introducing a new program for high school students: Our Companies Youth Production Team! Do you want to be a theatre professional? A choreographer, director, music director, or stage manager? Aspiring theatre artists looking for an advanced, selective experience, look no further. Students on our Production Team, admitted by interview only, will apply skills in their chosen area of artistry as they prepare to produce a musical theatre revue. Acting as Student Teaching Artists or Student Stage Managers, students on our Production Team will learn from mentors and gain valuable real-world experience for their resumes and portfolios. Email Youth@CFCArts.com to schedule an interview. The Musical Theatre Companies rehearse on a Spring and Fall semester schedule with two performances at the culmination of each semester. Registration for the Musical Theatre Companies is open through Monday, February 4, although students who desire a solo or speaking role are encouraged to attend auditions on Friday, January 11 or Saturday, January 12. For more information, see Schedule and Auditions below. 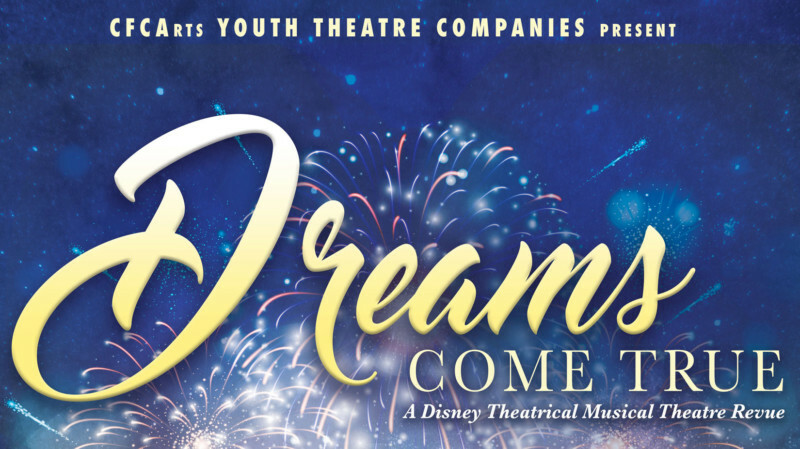 The Company show for Spring 2019 is Dreams Come True! For information on how to purchase tickets and see the show, visit our event page! CFCArts offers scholarships to all members equally, on an “as requested” basis, and does not consider age, gender, sexual orientation, race, religion, nationality or any other social demographic when determining a member for a scholarship. Apply now! Auditions are completely optional for this program! However, if your young performer in grades 3-12 desires a solo or speaking part, we highly recommend auditioning. Performers in Preschool through 2nd grade need not audition at all. There will be three audition blocks at various times on Friday, January 11 and Saturday, January 12 (No Callbacks for Companies.) Please see the Schedule below for times. Auditions will be held at Calvary Orlando, 1199 Clay Street, Winter Park. Exact location at Calvary will be sent out to selected students after registering for an audition block. Auditioners will be emailed an audition form once they have signed up for an audition block. Audition forms can also be found in the Forms section below. Please bring this form completed in its entirety to your audition. Auditioners will be emailed a conflict form once they have signed up for an audition block. Conflict forms can also be found in the Forms section below. Please bring this form completed in its entirety to your audition. All conflicts with the production schedule below must be fully and completely disclosed at or before the time of audition. Prepare and memorize a 16 to 32-bar selection from any musical theatre song. Please do not sing selections from popular music. Please bring sheet music. An accompanist will be provided. Tracks may not be used. Please bring a water bottle. Mess-free, nut-free snacks are permitted. Please wear proper attire for a dance audition. Dance or athletic shoes required. No restrictive attire, open-toed shoes, flip-flops/sandals, heels, or skirts/dresses without leggings or shorts beneath. No monologue is required. All auditioners will participate in cold readings from the script of our Troupe show, The Secret Garden. Auditions, as well as rehearsals, are closed to parents and family members. For safety reasons, only students and approved staff/volunteers are permitted. All auditioners should consider joining us for an Audition Workshop. We will be having an Audition Workshop for those auditioning for The Secret Garden (this will also cover those who are auditioning for both programs), and an Audition Workshop for those auditioning only for Dreams Come True. Our Audition Workshops will prepare young performers for the audition process! Auditions are OPTIONAL for students in Grades 3-12 who desire a solo and/or lines. For returning families – email youth@cfcarts.com to let us know that your child will be joining the Companies this season, and complete registration by paying season dues.